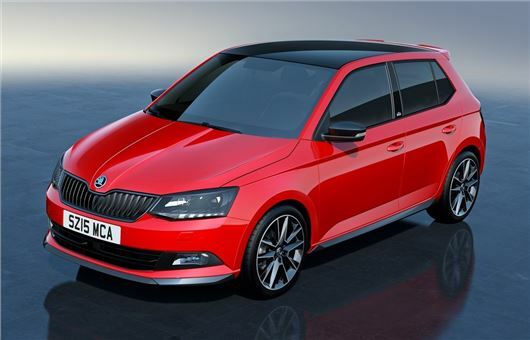 Skoda has launched the new Monte Carlo version of the latest Fabia. It gets a sportier look with 16-inch Italia black alloy wheels, a rear spoiler plus a black radiator grille and door mirror caps. Prices start at £14,645 and it's available as either a hatch or an estate. Based on the SE, the Monte Carlo gets extra kit including front fog lights, LED daytime running lights and a panoramic sunroof. Inside there are front sports seats, a red centre console, Monte Carlo pedals, grey roof lining and a multifunction sports steering wheel. The estate version also has black roof rails. As with the SE, the Fabia has DAB, Bluetooth, SmartLink plus a 6.5-inch colour touchscreen system. The Fabia Monte Carlo is available with a wide range of engines including the impressve new 1.0-litre MPI plus the 1.2-litre TSI with 90PS. The most powerful petrol is the 1.2 TSI with 110PS. Diesel choice is the 1.4 TDI with either 90PS or 105PS, both with a five-speed manual gearbox.